Cities: Capital — Ashgabat. Other cities — Turkmenabat (formerly Chardjou/Charjew), Dashoguz (formerly Dashowuz), Mary, Turkmenbashi (formerly Krasnovodsk). Terrain: 80% covered by the Karakum Desert, with dunes rising to the Kopet Dag Mountains in the south along the border with Iran; borders the Caspian Sea to the west and the Amu Darya River and Uzbekistan to the east; borders Afghanistan to the southeast, Kazakhstan to the north. Population (July 2009 est. ): 4,884,887. Population growth rate (2009 est. ): 1.14%. Education (2002 est. ): Literacy: 98.8%. Health (2009 est. ): Infant mortality rate — 42.34/1,000. Life expectancy — 68.52 years. Constitution: May 18, 1992. Last amended September 26, 2008. Branches: Executive: President. Legislative — Mejlis (Parliament). Judicial — Supreme Court. 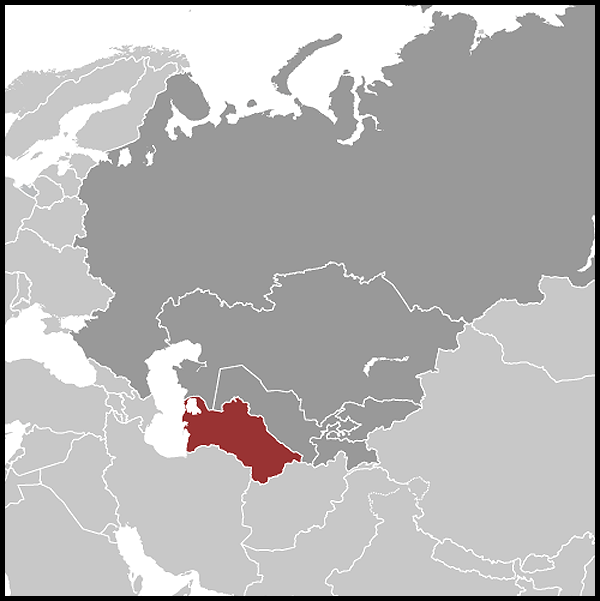 Administrative subdivisions: 5 welayats (provinces) — Ahal Welayat (Ashgabat), Balkan Welayat (Balkanabat), Dashoguz Welayat (formerly Dashowuz), Lebap Welayat (Turkmenabat, formerly Chardjou/Charjew), Mary Welayat. Agriculture: Products: cotton, grain, livestock, fruit and vegetables. Industry: Types: natural gas, oil, petroleum products, textiles, food processing. Trade (2008 est. ): Exports ($11.92 billion) — gas 50%, oil and oil products 32%, cotton 2%. Partners — Russia, Iran, Italy, Turkey. Imports ($5.67 billion) — manufactured goods 65%, consumer goods 34%. Partners — Turkey, Russia, Ukraine, U.A.E., China, United States. Debt, external: Reported $4 billion to the Chinese Development Bank; $1 billion to Islamic Development Bank. In the middle of the 11th century, the powerful Turks of the Seljuk Empire concentrated their strength in the territory of Turkmenistan in an attempt to expand into Afghanistan. The empire broke down in the second half of the 12th century, and the Turkmen lost their independence when Genghis Khan took control of the eastern Caspian Sea region on his march west. For the next 7 centuries, the Turkmen people lived under various empires and fought constant intertribal wars. From the 16th century on, Turkmen raiders on horseback preyed on passing caravans, pillaging and taking prisoners for the slave trade. In order to consolidate the Tsarist Empire in Central Asia, and upon the pretext of freeing Russian citizens from slavery, Russia sent forces to Turkmenistan, and in 1881 fighting climaxed with the massacre of 7,000 Turkmen at the desert fortress of Gokdepe, near modern Ashgabat; another 8,000 were killed trying to flee across the desert. By 1894 imperial Russia had taken control of Turkmenistan. The October Revolution of 1917 in Russia and subsequent political unrest led to the declaration of the Turkmen Republic as one of the 15 republics of the Soviet Union in 1924. At this time, the modern borders of Turkmenistan were formed. Following the end of the Cold War and the breakup of the Soviet Union, Turkmenistan declared its independence on October 27, 1991. Saparmyrat Niyazov became the first president of the new republic and was "president for life" until his death in 2006. Government efforts continue to focus on fostering centralized state control. The president controls the parliament and the judiciary. The civilian authorities maintain effective control of the security forces. Neither independent political activity nor opposition candidates are allowed in Turkmenistan. The Democratic Party of Turkmenistan (DPT) is the only legal political party. Political gatherings are illegal unless government-sanctioned, and the citizens of Turkmenistan do not have the means to change their government democratically. While the constitution provides for freedom of the press, there is virtually no freedom of the press or of association. The government has full control of all domestic media and restricts foreign publications. International satellite TV is widely available. The population is 89% Sunni Muslim. The constitution provides for freedom of religion and does not establish a state religion; however, in practice, the government continues to monitor all forms of religious expression. Amendments to the law on religious organizations adopted in March 2004 reduced membership requirements from 500 to 5 for registration purposes. All groups must register in order to gain legal status with the government. Until 2004 the only religions that were registered successfully were Sunni Islam and Russian Orthodox Christianity. As of August 2010, 11 other religious groups were registered. The government limits the activities of unregistered religious congregations by prohibiting them from gathering publicly, proselytizing, and disseminating religious materials. The government has started to review and rewrite its legislation with the stated goal of meeting international standards, including the criminal and criminal procedures codes and laws on religion and assembly. In late September 2008, a revised national constitution was adopted. It included provisions for a strengthened and enlarged Mejlis (parliament), eliminated many of former President Niyazov's arbitrary addenda, and contained some rights-related textual changes the international community had suggested. Most notably, it eliminated the Halk Maslahaty (Peoples Council), an oversized, bureaucratic, and largely rubber-stamp body whose powers have largely been transferred to the Mejlis. A legacy of a Soviet-style command economy greatly limits equality of opportunity. Industry is almost entirely dominated by government or government-owned entities. Services are now largely in the private sector. Agriculture is dominated by a state order system, mainly for wheat and cotton, although about 50% of food production is in private hands. In 2007, a law on state guarantees of the equal rights of women was adopted. Nonetheless, women continue to face discrimination, and their freedom is further restricted due to traditional socio-religious norms. All citizens are required to carry internal passports, noting place of residence. In July 2007, the government rescinded the requirement for citizens to acquire visas for travel to border areas. In 2008, Turkmenistan was the second-largest gas producer in the former Soviet Union after Russia with estimated production around 70 billion cubic meters (bcm). Turkmenistan's 2009 production declined to about 34 bcm. Gas production declined significantly when exports to Russia stopped on April 9, 2009, following a blast on the Central Asia-Center gas pipeline. Gas exports to Russia resumed at a reduced level (approximately 10.5 bcm/year) and price in January 2010. Since the end of 2009, Turkmenistan has been exporting natural gas in three directions: to Russia, Iran, and China. In 2010, exports to Russia were expected to total 10-11 bcm, exported through the old pipeline system built during the Soviet era. Gas exports to Iran were expected to reach 7-8 bcm in 2010, exported through two pipelines: Korpeje-Kurtkuyi (built in 1997) and Dowletabat-Sarakhs-Khangiran (built in 2009). The total capacity of the two pipelines is 25 bcm per year, providing room for further increase of exports in the future. At the end of December 2009, Turkmen gas started flowing to China through the newly built Turkmenistan-Uzbekistan-Kazakhstan-China gas pipeline (Central Asia-China pipeline). Turkmen gas exports to China were expected to total 3-4 bcm in 2010. Turkmenistan and China plan to boost gas supplies to 40 bcm by 2014-2015 when the pipeline reaches full capacity. Turkmenistan's 2009 oil production was about 10.3 million tons and was expected to total 10.4 million tons in 2010. Turkmenistan refines almost all of its oil inside the country and exports only petroleum products such as liquefied petroleum gas (LPG) and polypropylene. Turkmenistan has taken a cautious approach to economic reform, hoping to use natural gas export revenues to sustain inefficiencies in its economy. The disruption of Turkmen gas exports to Russia in 2009 and a subsequent decrease in global natural gas demand demonstrated the heavy dependence of the Turkmen economy on gas exports. 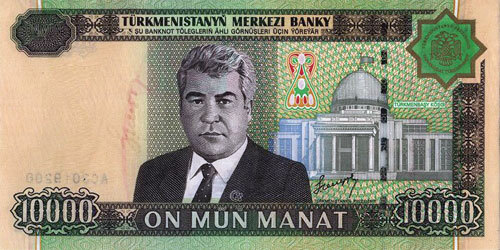 There are signs that Turkmenistan has a shortage of hard currency reserves. The country's foreign debt has been estimated at $5 billion. The private sector remains underdeveloped, with activity primarily in the food processing, consumer trade, and services sectors. In addition, Turkmenistan's statistics are closely held state secrets, and published GDP and other figures are subject to wide margins of error. Turkmenistan's goal of agricultural "self-sufficiency" artificially sustains the cultivation of inefficient crops, such as wheat and cotton. The 2006 UN Development Program (UNDP) Human Development Report placed Turkmenistan in the category of "medium human development" although unemployment and underemployment rates may be as high as 70%. Turkmenistan continues to cooperate with the international community to transport humanitarian aid to Afghanistan. The Government of Turkmenistan engages with the United States in many areas, including cooperation in border and regional security programs, educational exchanges, English-language training, and a long-standing Peace Corps presence. Despite the country's authoritarian political system, the government has taken some steps forward in human rights reform, such as lifting the exit visa requirement and allowing the registration of some religious minority groups. Its overall human rights record, however, remains poor. Diplomatic missions from various countries and international organizations have joined together to persuade the Government of Turkmenistan to improve its human rights practices, but their efforts have not yet led to significant improvements overall. For several years in the 1990s, Turkmenistan was a key player in the U.S. Caspian Basin Energy Initiative, which sought to facilitate negotiations between commercial partners and the Governments of Turkmenistan, Georgia, Azerbaijan, and Turkey to build a pipeline under the Caspian Sea and export Turkmen gas to the Turkish domestic energy market and beyond — the so-called Trans-Caspian Gas Pipeline (TCGP). However, the Government of Turkmenistan essentially removed itself from the negotiations in 2000 by refusing all offers by its commercial partners and requiring billion-dollar "pre-financing." Following a tripartite summit with the presidents of Russia and Kazakhstan in May 2007 in which gas was a major topic, however, President Berdimuhamedov again resurrected the idea of a Trans-Caspian gas pipeline, explicitly refusing to rule out the possibility of constructing such a pipeline in the future. The U.S. Embassy (http://turkmenistan.usembassy.gov/) is located at 9 1984 Street (formerly Pushkin Street), Ashgabat, Turkmenistan; tel: (12)35-00-45; fax: (12)39-26-14. USAID (http://www.usaid.gov/locations/asia/countries/turkmenistan/) is located at 1, Yunus Emre Str., International Business Center, 744017, Ashgabat, Turkmenistan, tel: (12)45-61-30 ; fax: (12)45-47-62. 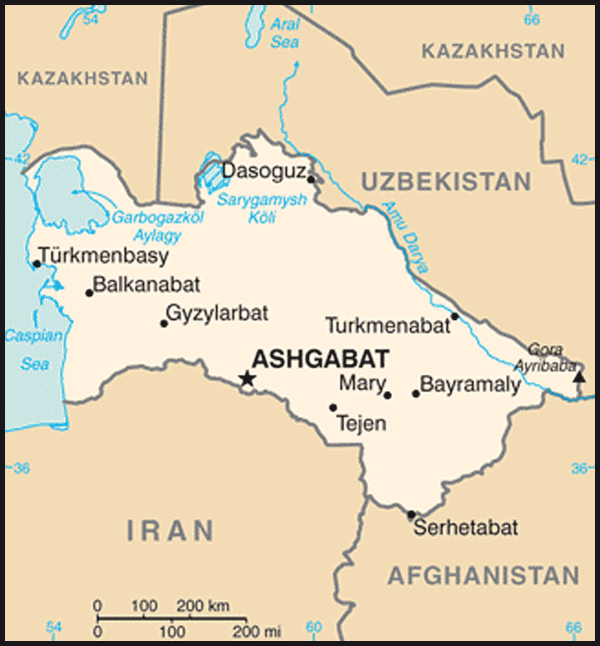 The Peace Corps (http://www.peacecorps.gov/) is located at 31-A Maty Kosaeva Street, Ashgabat 740000, Turkmenistan, tel:  (12) 35-59-14; fax: (12)51-12-08.